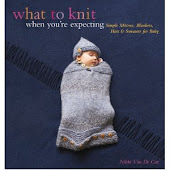 Tis the season to knit baby gifts. All of my friends are either pregnant or have just given birth (and now look immediately fabulous. Well done them). I guess it's something about not wanting to be 9 months heavy/hot in the summer. Autumn Leaves--for Baby Ella, trying to stick with the Jazz theme here--is my first baby-wear design. My cat's paw is shown for scale, and apparentlythe sweater already fits her perfectly. Or so I'm told. Rebecca owes me both a visit and a picture. I used a tweedy Scottish wool pulled from the bottom of a sale bin. I couldn't even tell you what it is exactly--just some mysteriously appealing DK weight wool. It was a little scratchy, but the colors were so perfect I was hoping it would be okay--surely Baby Ella would be wearing a onesie or something anyway, right? 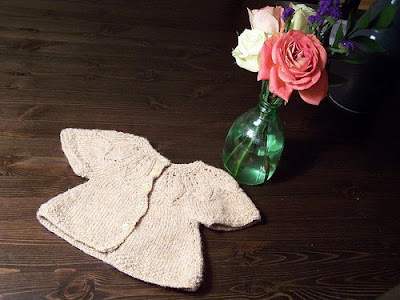 As it turned out, however, washing and (minimal) blocking produced the softest, cloudiest, drapiest little sweater dress. I love it, and I am, I'm not embarrassed to say, quite proud of it. I can easily envision it as Spring Leaves or even Summer Petals, given some different color choices. But then it wouldn't match the theme. I found the pattern for this darling sweater. Your directions are spot on! 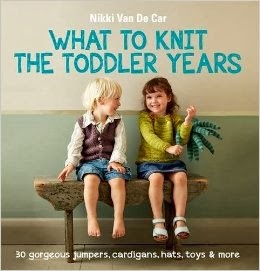 I've feared knitting a sweater, but you've made it delightful easy! I began sometime this afternoon and have reached row 26. 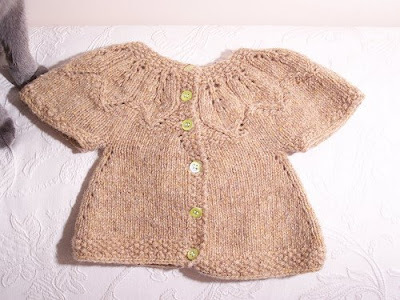 My beautiful granddaughter will look Devine in this sweater! Thank you!